Lindsay Mason: See you in Wickford! Only a few more days to leave a comment and maybe win my Blog Candy! So, do add your name...as they say...you have to be in it to win it! I'm all set for my trip down to Essex now. I'll be travelling down by train on friday, which, apart from the usual mad dash across London by Tube (which I never enjoy!) should be an enjoyable journey, watching the changing scenery and looking to see what wildlife I can spot in the hedgerows and trees. 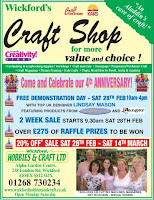 If you live near Wickford please do pop along and see me. It's going to be a busy day with lots of great new products and some interesting techniques. As you can see from the advert above, there is an anniversary sale on at the shop, so there wi ll be some great bargains to be had I'm sure. I'll hopefully get chance to take some pictures of the day, so will add those next week. Don't forget Craft Day on QVC tomorrow - I know that some of my stamps will be on in the 12pm slot. Meanwhile, here are a few more card samples featur ing some more of my new bird designs. The one on the right is another from a clear set (PICS013) featuring four birds, including the owl which I posted earlier. The one on the left is a large wooden stamp image (FR63)which I've combined with some K&Co "Cut n Paste" papers and some doodles done with our new Deco Colour pens. For the lovers of more cute images, the last card features my "Fluffy Owl" (FH116) stamped several times and added to a sponged background with a branch cut from black card. The eyes have been glazed with Glossy Accents and a hand written greeting added...another terrible pun!!! (In case you can't read it, it says "Have a hoot on your special day! "....I know, it's dreadful!) I have a very eclectic taste, but I do like making cards which raise a smile! Hope you like the avian collection of designs, whatever your taste is. Thanks for getting back to me on that Lindsay and for your kind words on my piece, I know you must be busy,busy,busy. 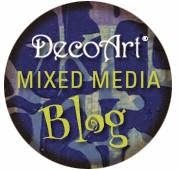 I too am eclectic although I do veer on the grungy side!! Love your birds. Am working but will catch QVC at some point and tape rest you can be sure. I am so in love with your new stamp, the one with the bird - Freedom! I do hope that Dawn get's it in to the store soon! Looks like you had fun at the show although I'm sure your a little tired! I am looking forward to seeing you on the 12th, we must take some nice photo's for our blogs. I hope that David is feeling better?